Do you want subscription socks now? A fresh pair of socks, delivered to your home monthly. 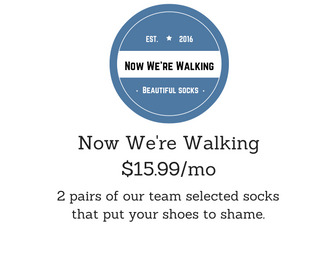 Socks subscription service starting at $10.99/mo. with free shipping. We're a fun, passionate and sock crazy company founded on the principle that everything we do, must be done with YOU in mind. Our mission is not only to send you AMAZING subscription socks, but to make sure your EXPERIENCE with Socks and I, is one of a kind. We can't wait to ship you your monthly sock package! Sign up with your email address to receive special promotions and news about our subscription socks packages. We respect your privacy. Your information will not be sold or used for third party marketing.